"Sorry for your lose. She was a great lady. 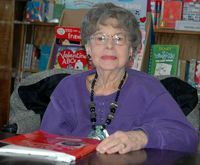 Admired her..."
"Ms. Kassell was a great neighbor and friend. She impacted..."
Paula Kassell, a long-time activist for women's rights, an original member of the Women's Institute for Freedom of the Press, died August 20, 2012 at home in Dover, N.J. She was 94 years old. Her successful hospice was reported by her son, Daniel Kassell of NYC. The news tabloid she founded went national as New Directions for Women in 1972, preceding Ms. Magazine. Ms. Kassell bought shares of New York Times stock so as to be admitted to its stockholders' meetings. Speaking to Publisher Arthur Ochs Sulzberger, Ms. Kassell said the refusal to use "Ms." created inaccuracies. "Your daughter Karen retained her name when she married. Did she become Mrs. Sulzberger?" he replied "I've been trying to figure that out myself. On June 19, 1986 the Times honorific became effective. Paula Kassell, a feminist from college onward, said her goal was a society that did not try to "put anyone in a mold, "I could make of myself what I willed." After graduating from Barnard College in 1939 she raise a son and a daughter returning to work in 1955 as the first female technical editor at Bell Laboratories. New Directions for Women (NDFW) was organized in 1971 by a coalition of women's rights groups, including the National Organization of Women. The University of Missouri houses the newspaper's archive. Besides her feminist friends, she leaves a son, Daniel. Her daughter, Claire Friedman-Foodman died of breast cancer. Ms., Kassell herself defeated breast cancer twice. Survived by granddaughter Julia Foodman of Somerville, MS and grandson Michael Kassell Foodman of Hollywood, CA. Gerson G. Friedman, a well-respected agent for Equitable Life, predeceased his wife. There will be no funeral service as she donated her body to the New Jersey Medical College. A memorial, which she helped to plan, will be announced by New Jersey NOW members in October. Donations may be sent to: Paula Kassell, 25 W. Fairview Avenue, Dover, NJ 07801 to be apportioned to further women's rights per her wishes.